KT Travel Ltd is an Irish owned Travel Agency who offer a full selection of holiday options including: Summer and Winter Sun, Ski, City Breaks, Football Trip, sports Trips , Worldwide, USA & Canada, Cruise, River Cruise and Sunsail, Club Med, Escorted Tours, Weddings & Honeymoons and Lapland. More importantly we are proud of our 10 year reputation for providing good value quality holidays at the best price. And what is more re-assuring in the current economic climate, KT Travel is a fully bo nded travel company under license no. T.A 06321 – so don’t take chances with non-bonded companies! · We understand what Irish holidaymakers want and deliver it all the time, as our loyal customers show, time and again when they book with KT Travel. On the 15th December 2005, Karen Thornton opened our doors to the public. Over the next 10 years we built the business even becoming an award winning Travel Agency. 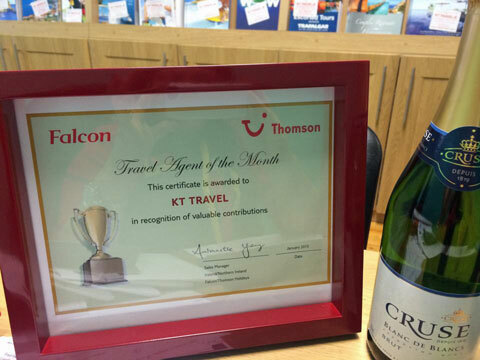 Since day one, KT Travel has grown from strength to strength. We have a team of 6 staff with excellent knowledge and experience and have a huge passion for travel and strive on listening to people’s opinions and looking for new angles to develop the business. We are focused on worldwide trends in travel and leisure and are constantly searching for innovative methods to market the company. We have a policy of never standing still and every year our destinations and properties on offer are reviewed and updated. We are proud of all our achievements and being an award winning Irish owned Travel Agency and look forward to providing you with a quality holiday now and in the future.